Other design features which help to guarantee longevity and high quality performance, include the intelligent design of the cutting blade, which reduces running costs and lengthens the life of the blade by ensuring the blade twists, rather than breaking, if it hits an obstacle. The steel cutting deck is similarly blessed by Honda’s expert engineering, and treated to resist rust, corrosion and UV abrasion for greater durability. Furthermore, storage is made far easier by the mower’s folding handlebar, while a low overall weight of only 37kg means that transportation is similarly straightforward. 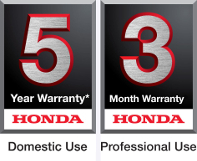 Finally, Honda’s confidence in the quality of the HRG 536 VK is such that they even offer a full three year warranty as standard, meaning you can use this machine safe in the knowledge that it is built to last. Ideal if you like perfection and accuracy. SMART Drive®is designed to allow you greater accuracy around trees, edges, walls and flower beds by giving you fingertip control of ground speed, helping you mow large areas with ease.